If you are looking for the best PSD to Magento conversion services provider, you've come to the right place! One of our rules is to constantly improve our dev knowledge and learn new technologies. You can be sure your PSD design files will be professionally converted to Magento templates. In the last couple of decades online shopping became a real giant of the business world, which in turn increased the number of ecommerce websites. A few years ago the world met Magento and today it is considered one of the most powerful and flexible ecommerce platforms. The look of an online store is of a great importance to establishing a solid successful business. That is why it is essential to develop attractive design, and more importantly, to convert this design to web. Let's create design that will perfectly fit your brand together! There are several ways to turn site visitors to customers, and PSD to Magento conversion is one of the most effective and fast ones. If you wish to try it yourself, but don't have ready-made PSD template, we have a great option for you. A team of dedicated designers and developers form SocialEngineMarket is waiting for your ideas! Custom design creation is among PSD to Magento theme development services that we provide for ecommerce. Drop us a message, let's discuss your project and make out something unique. Our experienced designers will gladly create a modern Magento template for your site. Our markups coded entirely manually, thus final outcome is always pixel precise. You can be sure that the PSD files you share with us, will look as great on the web as the mockup. What are the benefits of Magento CMS as a base of your website? Why choose SocialEngineMarket to convert PSD to Magento theme? The appearance and presentation of your ecommerce website is the first what customers pay attention to. Our Magento experts know exactly how to implement conversion of your designs into pixel-perfect corresponding all the standards web pages, so that your sales will grow. We always code 100% manually, our markups are structured, semantically correct and clean, so we guarantee that your Magento theme will be appealing and user-friendly for your customers. Among the dedicated specialists who will work on your project, a significant role plays QA team. In order to let the users all over the world flawlessly access your Magento site, they make sure it is compatible with all core web browsers. All professionally coded markups must be W3C valid. What means that they correspond all established by World Wide Web Consortium (W3C) standards and have been checked for markup validation. Our HTML coding is completely safe and meet the determined requirements. That's why the structure behind your beautiful design will be reliably clean and well-formed. Our support agents are tech-savvy guys and will be able to answer any your questions in fast and professional manner. A dedicated project manager will happily assist you on every stage of the development project. If you experience some difficulties managing the site even when the work on the project is over, don't hesitate to contact us, too! Your 100% satisfaction is our number one priority. 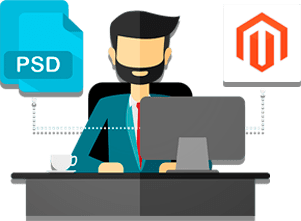 How does the process of PSD to Magento work? Magento is a complex system that includes many features, so it takes time and requires competence to merge files into it. The list of its advantages is endless, though the process is quite easy to describe. We know that understanding of the entire working process is very important for you. We offer you a short description of our PSD to Magento template / theme conversion stages. We examine the files you send us and analyze your request. We contact you to discuss all the details and requirements. We slice your PSD files into different design segments. Programmers convert the picture segments to HTML. HTMLized files are getting merged into Magento.